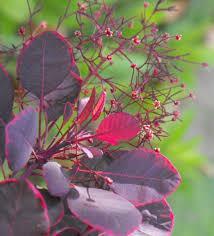 New dwarf rich wine red rounded leaves turn bright red in autumn. Dainty seed heads, July to August giving effect of smoke hence common name smoke bush. Sun or semi shade. 1.2m tall.